JEEPERS is a folk music ensemble from Tampere and Kangasala, Finland. We perform in private events and on public arenas. We are running JEEPERS Folk Clubs at Pirtti in Kangasala. Welcome just to hear and feel us – or to play with us. We are always glad to invite guest musicians on stage. 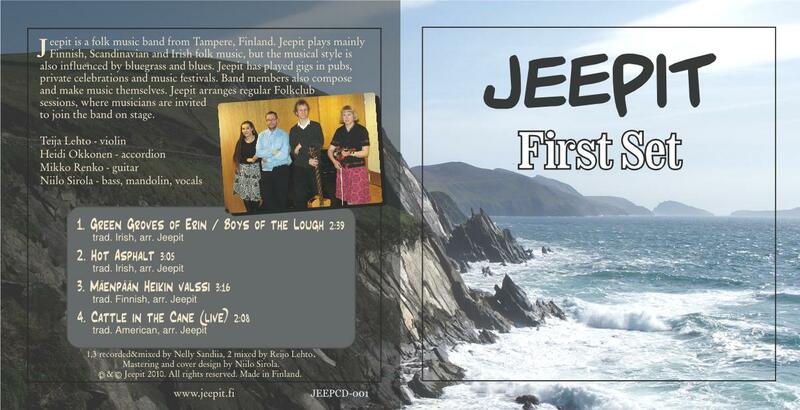 JEEPERS plays folk music on a broad scale: Finnish, Scandinavian, Irish folk music, and also American bluegrass. Blues is not strange to us either. On request we also play folk style traditional Finnish dance floor music – it has been very delightful in many private occasions! We mostly make our own musical arrangements. We are running JEEPERS Folk Club evenings in Pirtti in Kangasala. Please contact us, if you would like to join us. By agreement pubs, clubs, festivals , weddings, folk-music style dance floors, private celebrations. Acoustically or slightly electronically amplified. We can bring our own PA devices. First Set is a four-track demo CD that we made in 2010. Unfortunately there are no more CDs left of the original 100 copies release. JEEPERS band used to be called JEEPIT until September 2017. We have some music samples on the Demo page, and also on YouTube. Follow our Facebook group! Join it now! In case you do not have a Facebook account, you can leave your comment here too. For the contact information, see the Contact page.